I have shared my excitement throughout this entire Spring for our nesting Bewick’s wrens. The same pair have nested in two different houses on the patio. Their first brood was four babies. A second brood fledged Thursday; three more! The birdhouse is about 5 feet from where I sit while drinking my coffee each morning outside. 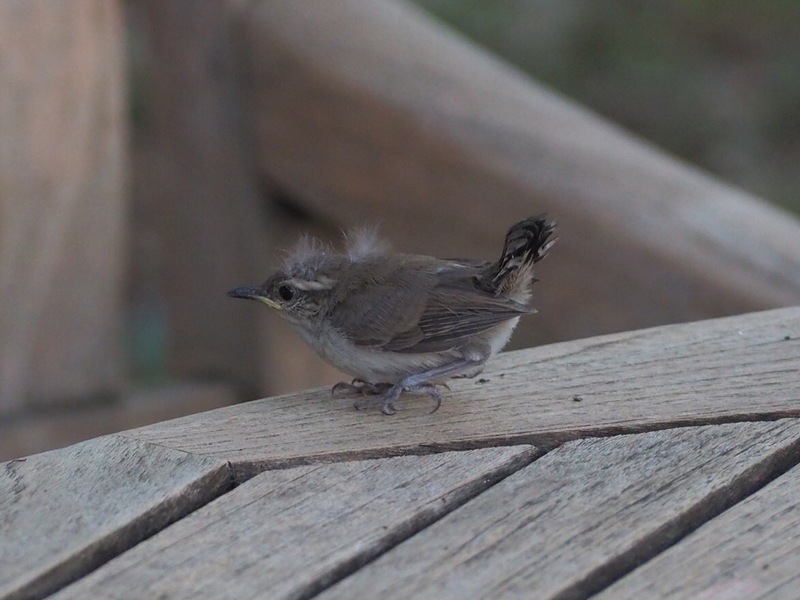 The little wren parents were used to me and would fly back and forth to feed the babies while I was sitting there. So sweet. This is the second of the three that fledged. Author sheila365Posted on 05/27/2017 05/27/2017 Categories Critters, Fun, inspiration, Life, NatureTags 365 prohect, backyard birding, bewick's wren, photoblog, photographyLeave a comment on More Bewicks. Yesterday, our resident mom & dad Bewick’s wrens started building a second nest! In a different house than this season’s first brood. I’m pretty sure this is the same mom & dad, since I’ve been watching them tending to and feeding their babies at the same time that they are building the new nest. I’m just amazed at how hard this pair of birds have been working over the last 6 weeks or so. I was surprised to see this behavior, but found this website whose explanation of their nesting behavior helped me learn a bit more about this lovely bird. I can’t wait to watch the next round of babies make their way into our backyard. Author sheila365Posted on 04/18/2017 Categories Critters, inspiration, Life, NatureTags 365 project, bewick's wren, birds, photoblog, photographyLeave a comment on Again! Today I sat 10 feet from the birdhouse outside and watched the baby wrens fledge! I saw four of them fly out, there may have been more. I hope they come back to nest next spring under the eaves, too. I thought I recorded a video of it, but apparently I don’t know how to use the video mode of my camera yet. Oh well, it was very cool to see it happen. I’m so excited that I was able to watch them, especially since we spent the entire weekend on the lake. And Monte and I had just returned to the house after running an errand. Five minutes later they were all out of the birdhouse. Author sheila365Posted on 04/10/2017 04/10/2017 Categories Critters, Fun, inspiration, Life, NatureTags 365 project, baby birds, bewick's wren, fledgling, photoblog, photography1 Comment on So proud! The backyard is getting quite crowded with bird-thingies. The latest one is a bark butter feeder that I hung up a couple of weeks ago. Bark butter is a spreadable kind of bird food that you can mush onto the bark of a tree, or onto a hanging feeder. You can buy both bark butter and bark butter feeders. But, I decided to try my hand at making both myself. Long story short, the birdies like it! This is a Bewick’s wren snacking on it. I have also seen black crested titmice and woodpeckers try it out. To make the feeder, I grabbed a couple of pieces of cedar scrap from the shop, drilled shallow holes in each side with a forstner bit. I staggered the holes on each side so they were not directly opposite each other, so that I wouldn’t accidentally drill all the way through the board. Then I glued and nailed a piece of wood on top as an awning. I didn’t measure, but I’d say that my board is about 16″ long and 6″ wide. There are recipes on the web for bark butter that contain lard and corn meal and peanut butter and bird seed. I simply got some all-natural peanut butter and mixed it with my current bird seed mix (mine is a mix of peanuts and whole sunflower seeds and millet) until it was spreadable. Then I stirred in some cayenne pepper to dissuade the squirrels. I spread some into each of the holes on the feeder and hung it up. Within a week I saw some birds feeding off of it; which made me smile. Author sheila365Posted on 03/11/2017 03/11/2017 Categories Critters, inspiration, Nature, Projects, RecipesTags 365 project, bark butter, bark butter feeder, bewick's wren, DIY, photoblog, photography1 Comment on Bird thingie. I’ve been observing my backyard especially carefully over the past several months. I love that I was able to observe several Bewick’s wrens among the frequent visitors. I recently hung a couple of new birdhouses up under the eaves, hoping to get some takers this year. We also have a number of older birdhouses that have been hanging out there for several years, including one that I made and hung in the backyard over six years ago. As I have been stalking my backyard birds more carefully, I’ve watched two pairs of Bewick’s wrens pick out houses in which they have built nests. Rest assured, I will keep an eye on them and report back. 🙂 This is one of the residents of a new house that I hung a few weeks ago. I bought it at Joann’s – it had the desirable-to-bewicks dimensions. I drilled holes in the bottom for airflow, and I also cut off the perch. So cute! This is the one of the new residents of the seasoned peek-a-boo bird house I made in December of 2011. Happy to see it in use. I’ll be watching to see what develops. Author sheila365Posted on 02/28/2017 03/01/2017 Categories Critters, Fun, inspiration, Life, NatureTags 365 project, bewick's wren, bird houses, birding, photoblog, photographyLeave a comment on I ♥ Bewick’s.